Don’t miss our 9th Annual Stone Harbor Shiver! Enjoy a March weekend at the beach with family and friends and take a dip in the beautiful and COLD Atlantic Ocean! Proceeds will benefit Family Promise of Cape May County – a charity that supports, counsels and works to place homeless parents and children in permanent homes; and the Stone Harbor Chamber of Commerce, so we can continue to hold the Shiver and other great events throughout the year! 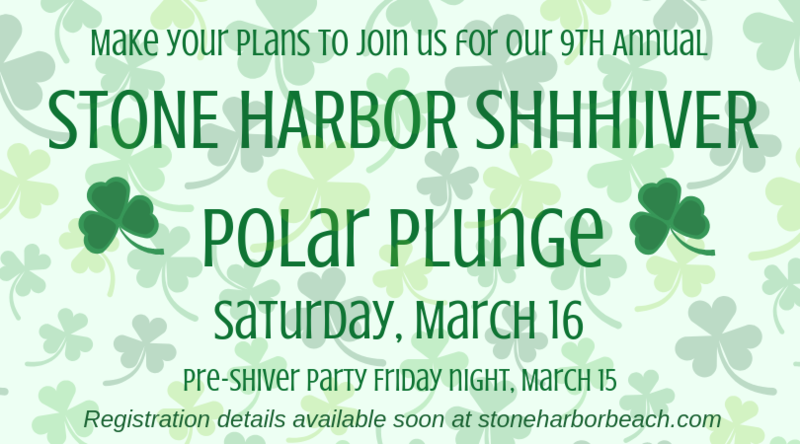 Your weekend fun will begin Friday night at the The Reeds at Shelter Haven, 96th Street & Third Avenue, for the Pre-Plunge Party! $20 includes buffet, cash bar. Fred’s Tavern will host “Kegs & Eggs” Saturday morning, beginning at 10:00am. At noon, we’ll parade to the beach front parking lot at the Women’s Civic Club. The fun continues when participants are introduced and entered into the “Best Of” contest, where trophies will be awarded for Best Team Name, Best Float, Best Team Costumes, Best Individual Costume, Youngest & Oldest Shiverer, and the “Grand Prize” for the Best Team Performance. Start thinking of your costumes & theme song now! We’ll be hitting the water’s edge by approximately 1:15 pm! We just can’t wait! After your dip in the ocean, there will be a post-party at Fred’s Tavern, 314 96th St. Gather your friends and family and come Shiver with us!